On roughly 3/4 of prime hilltop real estate in Vigie, sits Villa Solimar a 10,070 square feet enclave complete with a 50 foot salt system solar heated pool with deck and covered gazebo, gym and sauna, satellite office, maid’s quarters and a 3 car garage. The two storey Mediterranean style Villa offers the ultimate in privacy and understated elegance. Its unique location makes it truly one of the most incredible sites with breathtaking views of the Castries harbor, historic Morne Fortune, the west coast and sparkling waters of the Caribbean Sea. The villa commands a 300-degree view only interrupted on the west by the picturesque Vigie lighthouse. There are 4 bedrooms with 4.5 baths, a roof deck, landscaped gardens with sprinkler system and solar energy in the pool and the entire house. 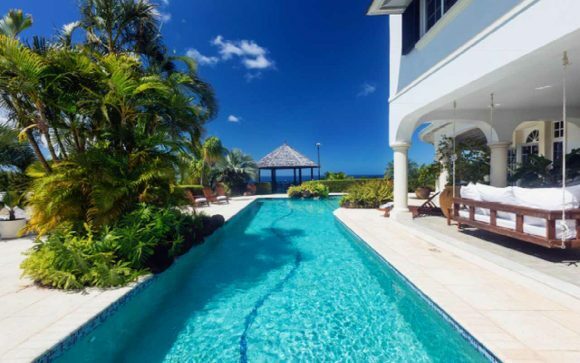 Villa Solimar has been meticulously maintained and is ideal for Caribbean living. Main house consists of reinforced concrete frame with load bearing block work in internal/external walls and Bermuda style concrete and metal roof. 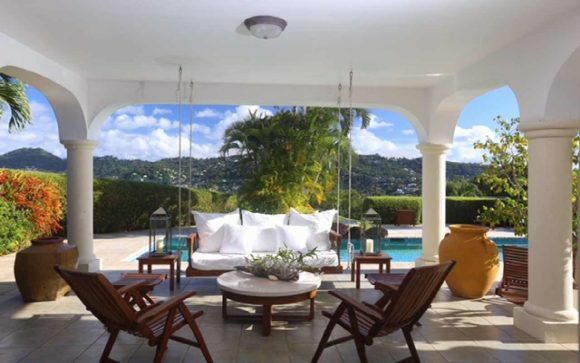 Located in desirable Vigie, minutes from George Charles Airport, Vigie beach and Castries, the capital city. Transitional decor scheme with understated elegance, neutral colour tones, luxuriant fabrics, carved wood and contemporary upholstery for modern glamour.